Matchbuilding is an absorbing hobby made easy with our Hobby's Matchcraft kits by the use of preformed shapes, yet allowing scope for individual skill. Suitable for all ages, though some easier than others. 245mm long x 153mm wide x 172mm high. Not too hard to do, though they do take some care and some time. 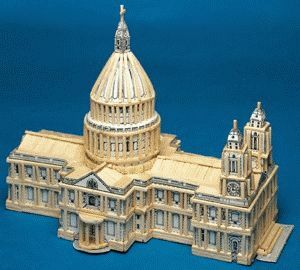 These matchstick model kits all include shaped card formers, matchsticks, glue and instructions. say which in your order notes. Dutch Windmill - size 368mm high, x 140mm wide. Big Ben - size 114mm x 89mm x 445mm high. Tower of Pisa - size 356mm high, x 89mm diameter. Arc de Triomphe - size 191mm high, x 191mm wide, x 64mm deep. Tower Bridge - size 381mm long, 203mm wide; 184mm high. Kits contains : Matchsticks, Cardboard cut-out formers, Glue and Full Instructions. Great to do yourself, or a great present ! "My granddad loved doing this, and has it in his bedroom !!" "Great doing this, and lovely having it. I plan to do many more now." - Only £11.99, click to BUY now ! . 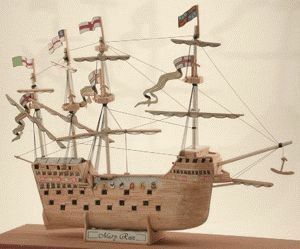 Or what about making a stunning matchstick Mary Rose galleon ship ? Hobby's Matchcraft kit to make a superb matchcraft model of English king Henry the Eighth's 78-gun flag-ship the Mary Rose, the warship sunk in 1545 off Portsmouth and raised off the sea bottom in 1982. - Size : 406mm long x 140mm wide x 318mm high. Kit contains : Matchsticks, Cardboard cut-out formers, Glue, Stickers and Full Instructions. Everything you need to make this kit. Only £13.99, click to BUY now !! 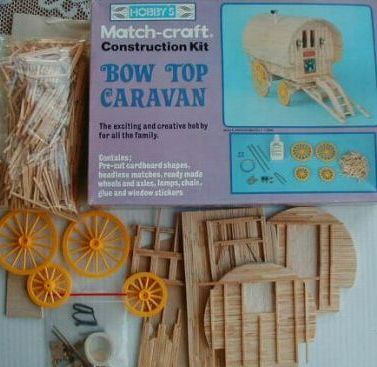 Or what about making an impressive matchstick Gypsy Caravan (Ledge Caravan or Bow Top Caravan) ? Only £18.99, click to BUY now !! PS. If you can visit our Freeman Street Grimsby shop then you should also find some other matchstick kits and supplies. otherwise, if you have any view or suggestion on the content of this site, please e-mail Wilmots or write Colin Wilmot, 166 Freeman Street, Grimsby, N.E.Lincs, DN32 7AT.